A super PAC, campaigning for Jeb Bush to become the Republican presidential nominee, embarrassed its candidate when it sent out 86,000 leaflets in which he appears to have two different-colored hands. The leaflet, sent ahead of the primaries in Iowa, where Bush is slipping behind the ubiquitous Donald Trump, was headlined “Why Jeb?” and has attracted widespread online mirth. While many speculated that the head of the third member of the Bush clan who could become president, was grafted onto the body of a black man, the truth turned out to be more about carelessness than manipulation. The photo of the candidate was cropped from an earlier pic, where he was posing together with potential voters. 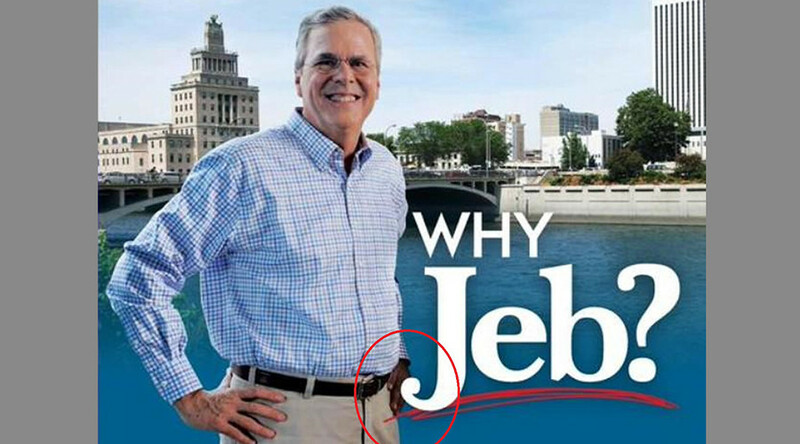 Then a new background of Cedar Rapids in Iowa was inserted into the poster, with the designer failing to notice that the now-unseen shadow from the original pic made Bush’s hand look black. The error might seem amateurish, (after all it was produced by Right to Rise, a super PAC with a $100-million plus campaign war chest), but it is indicative of a wider issue in US campaign practices. According to somewhat arcane regulations, Political Action Committees (PACs) are allowed to collect unlimited donations on behalf of the candidate, but cannot co-ordinate campaigning directly with them. So instead of asking Bush to pose next to a bridge in Iowa, or in front of a green screen, Right to Rise was forced to use an existing image. Once regarded the undisputed frontrunner in the nomination race, due to his family name, solid record in office, and popularity with Latinos, Bush’s campaign has failed to catch fire. The voluble billionaire Donald Trump has managed to commandeer the vast majority of media headlines. He leads in the polls, while Bush has been on the back foot, embroiled in several controversies, such as using “anchor babies,” a pejorative term referring to children of illegal immigrants. Trump himself wasted no time making fun of Bush's latest gaffe.